The holidays are over and winter is officially upon us, and with it comes the cold, snowy and icy weather in West Virginia. Although beauty and peacefulness can come with the snow, for many of us, winter also means staying inside for longer periods of time, giving us a classic case of cabin fever. The cold, short days and icy conditions outside can sometimes feel indefinite! 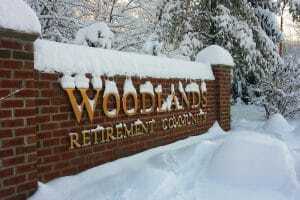 However, for residents at Woodlands Retirement Community, winter weather is no hindrance to their active lifestyles! Thanks to the maintenance-free lifestyle at a Continuing Care Retirement Community (CCRC), residents enjoy their daily activities without the seasonal burdens of living in a house. Winter in a home outside of a retirement community can bring many additional responsibilities, like winterizing the property, shoveling, salting and more. Furthermore, these stressful winter chores take time away from enjoyable activities, like meeting friends or practicing a hobby, and they can be difficult for older adults, especially those who are frailer or have health concerns. For those unable or choose not to do these winter chores, the cost to hire professionals can be hefty, and your life gets put on hold until the crew completes the chores at your house. The winter leaves many of us spending days inside, avoiding the cold and less-than-ideal road conditions. Some even avoid shoveling altogether by letting the sun do the work for them ­– but that can take a long time, especially during the unpredictable winters of the Ohio River Valley. Staying indoors for so long can make us prone to isolation and many other health concerns. Picking up groceries and prescriptions can even become an issue. It may require you to make special arrangements to get these essentials. The responsibilities that winter weather bring to our area can make the season difficult and often unpleasant for many. However, life during the cold winter months doesn’t have to be this way – just ask any of the residents at Woodlands! Residents of Woodlands do not carry the anxieties of snow removal and de-icing all winter long. Thanks to the campus maintenance staff, plowing, shoveling and salting are no longer your responsibility. Even better, these services are included in your monthly service fees, so it’s no additional cost to you. Instead of bundling up to venture out and shovel, residents spend their time and energy on the things they truly enjoy, like visiting the community salon or library, volunteering on campus, playing cards with friends in the game room, grabbing a bite to eat with neighbors or exercising in the wellness center. Social opportunities are never in short supply, and plenty of friends are nearby to keep cabin fever at bay. For residents who want to take a trip off campus, community transportation services are available. As a resident, you’ll still be able to make a safe trip to the grocery store, pharmacy, bank or elsewhere, regardless of the weather outside your window. You’ll be challenged to find a resident at Woodlands who has the winter blues. There’s so much to do in the community, and so many peers and helpful staff are nearby. For more information on what it’s like to live at Woodlands, give us a call at 304-697-1620, or visit us online to request a personal appointment and tour. We look forward to hearing from you!